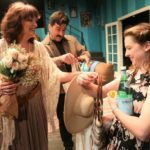 Enjoy this interview with the cast of “The Chekhov Comedies” at Brand Park, playing through Apr 27th. You can listen to this interview while commuting, while waiting in line at the grocery store or at an audition, backstage and even front of the stage. For tickets and more info Click here. 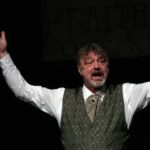 Enjoy this interview with the cast of “Faith Healer” at Odyssey Theatre, playing through May 12th. You can listen to this interview while commuting, while waiting in line at the grocery store or at an audition, backstage and even front of the stage. For tickets and more info Click here. 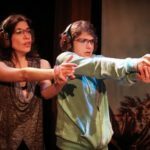 Enjoy this interview with the cast of “Friends With Guns” at The Road on Magnolia, playing through May 5th. You can listen to this interview while commuting, while waiting in line at the grocery store or at an audition, backstage and even front of the stage. For tickets and more info Click here. Enjoy this interview with the cast of “The Elephant Man” at The El Portal Theatre, playing through Apr 14th. You can listen to this interview while commuting, while waiting in line at the grocery store or at an audition, backstage and even front of the stage. For tickets and more info Click here. Enjoy this interview with the cast of “My Big Gay Italian Wedding” at Hudson Theatre, playing through Mar 31st. You can listen to this interview while commuting, while waiting in line at the grocery store or at an audition, backstage and even front of the stage. For tickets and more info Click here. 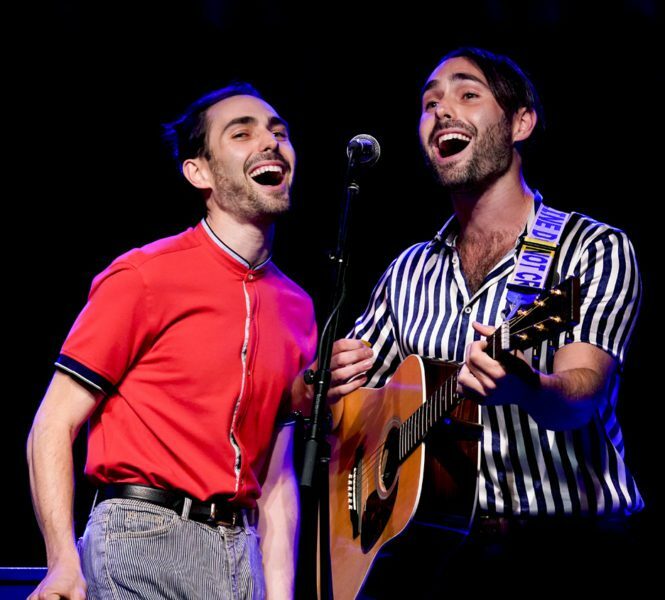 jackbenny, the dynamic musical duo comprised of twin brothers Jack and Benny Lipson, is exactly what the music industry and the world need right now. They are young, grounded in tradition, bounding towards what’s next in the world of sound, and always refreshing. 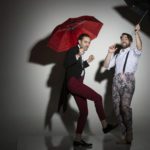 On the eve of their upcoming show National See-A-Show Day!, debuting at the Luckman Intimate Theatre for one-night only this weekend, I had to buzz with these boys about music, their current work, and – of course – queerness in artistic expression. Here we go! Roger Q. Mason (RQM): How did jackbenny begin? Jack and Benny (JB): Growing up here in LA we started jamming together in our tweens singing songs by artists and composers we admire. Benny moved away to Miami for undergrad and as soon as he returned the two of us began playing bass and keyboard, respectively, in a handful of local bands. But soon we grew antsy to write and perform original material with more pointed lyrics and unbound to prescribed musical formulae. We retreated to Sedona, Arizona for a week in December 2016, and thus spawned jackbenny and our first batch of songs. RQM: Let’s talk about style. You two beautifully meld musical theatre, jazz, pop, rock and other influences to create a very unique live concert aesthetic. What was the inspiration behind your sound? JB: We love all the musical styles you listed and more, and of course we invite them into jackbenny‘s sound! We decided to link our material not necessarily through a certain soundscape – although we do stamp our songs with surprising harmonic diversions and metrical twists – but rather through their savvy and sometimes provocative lyrics addressing contemporary social phenomena. In musical theater the same composer can churn out disparate scores from show to show as they craft in service to the characters and drama; we believe each of our lyrics earns that specificity…the music in a way writes itself! RQM: Tell me EVERYTHING about It’s National See-a-Show Day!! RQM: Okay, breaking with form – I’m going to ask 6 questions – not five. Jack, what’s it like working with Benny? Jack: Honestly I can’t fathom working solo – who can fulfill both the artistic and especially the auxiliary managerial work singlehandedly?! In writing and executing our material, we expect utmost excellence of one another, and often this manifests in frank, brusque criticism…that shortly evolves into laughter. On the business end, Benny and I’ve started to carve our own territories: Benny oversees and edits video content for jackbenny’s website, YouTube, and Facebook pages while I manage our Instagram and mailing list, as well as write all prose surrounding the project. RQM: Benny, what’s it like working with Jack? Benny: Collaborating with a sibling is both comfortable and challenging; we never hold back how one another is thinking or feeling, good or bad. Since we know one another’s capabilities, we push to those limits. I often keep Jack focused on the tasks at hand and monitor his musical ideas from reaching a level of absolute obscurity. Our personalities as composers and businessmen complement nicely. RQM: Can you tell us anything about your new work Brainstorm? JB: Brainstorm is a musical theater song cycle of our songs, many of which we’ll perform on Saturday. The one-act zooms in on three twentysomethings navigating today’s ever-confounding socio-political scene. In continuous sequences of song and movement, they share their newfangled ideas on queer identity, climate change, consensual conduct, bee extinction, healthcare, bureaucracy, and more. The millennials by the piece’s close not only refute putative misconceptions of their caricatured generation, but come to empathize with one another on a mutual journey towards a more just and compassionate world. Actually major news regarding Brainstorm began brewing – pun intended – just last week, though we can’t formally share just yet…but our audience at the Luckman will be first to hear! RQM: And finally, let’s talk about queerness music. What makes music or a musician or a style of music queer? And why should everyone care? JB: To start, a couple of our lyrics directly explore queer identity, of course the aptly named “Queer” and its companion number, “Asking.” Other lyrics refer to queer relationships when much music offers either definitively straight characters or nebulously dodges sexual identity as not to expose the creators. 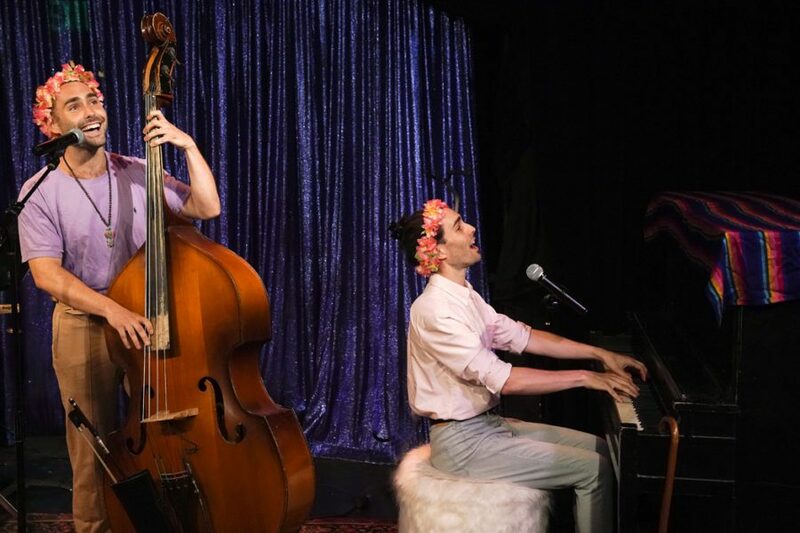 But much of the content of our songs, as well as our shows’ theatrical aesthetic, stems inevitably from conversations and interactions through our deep involvement in the LGBTQ cultures of LA and New York. Whereas other artists fear this “queer” label will pigeonhole their art towards a niche audience, conversely “queer” to us embraces a spectrum of individuals as variegated as the rainbow. We want those individuals to find themselves within the characters of our music, and hopefully glean from them truths they’ve – and even we’ve – yet to discover. For more information about their show, go to LuckmanArts.org or call (323) 343-6600. 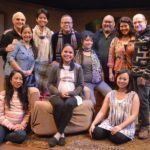 Enjoy this interview with the cast of “America Adjacent” at Skylight Theatre, playing through Mar 24th. You can listen to this interview while commuting, while waiting in line at the grocery store or at an audition, backstage and even front of the stage. For tickets and more info Click here. 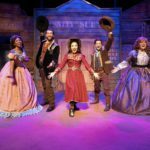 Enjoy this interview with 1989 Tony Award winner for Best Lead Actor in a Musical – Jason Alexander and the cast of “The Joy Wheel” at Ruskin Group Theatre, running until Mar 24th. You can listen to this interview while commuting, while waiting in line at the grocery store or at an audition, backstage and even front of the stage. For tickets and more info Click here. 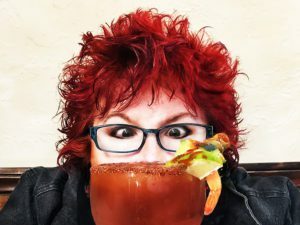 Writer/performer Barra Grant is back with her darkly hilarious mother-daughter story: the true, inside tale of Grant’s seismic relationship with her mother, Bess Myerson. 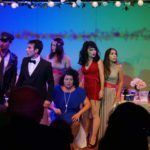 Enjoy this interview with the cast of “Miss America’s Ugly Daughter” at Greenway Court Theatre, running until Mar 24th. 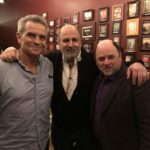 You can listen to this interview while commuting, while waiting in line at the grocery store or at an audition, backstage and even front of the stage. For tickets and more info Click here. 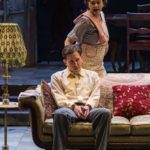 Tennessee Williams’ The Glass Menagerie is as classic and American a drama as they come. Most of us have had to study it – perhaps in drama school or high school literature class. It exists in a place somewhere between venerable literary text and dramatic playscript. Like memory, as Williams invokes it in the script, our perspective on the play is often-times romantic, soft, nostalgic. However, what has always fascinated me about the play as it appears on the page (particularly in Tennessee Williams’ stage directions) is how experimental, meta-theatrical, and innovative the piece wanted to be. Fourth wall address, projections of imagery and text, and expressionistic music are prominently featured as narrative devises. Sounds like something out of a Paula Vogel text. But it was Williams. Rest assured. Now, more than 70 years since The Glass Menagerie first appeared on Broadway, A Noise Within is reviving the work. Recently, I interviewed actor Rafael Goldstein, who is playing Tom Wingfield in the Geoff Elliot-helmed production. 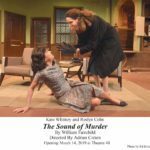 We could not help but gush over what it means to return this play to its technologically and meta-theatrically adventuresome roots in A Noise Within’s current production. Roger Q. Mason (RQM): The Glass Menagerie is noted for innovating the contemporary memory play. Playing Tom, what was your process navigating his memories of his family and his dilemma in the present? Rafael Goldstein (RG): That is the primary challenge of playing Tom. He is, at once, something of an omniscient narrator, while also being helpless in the riptide of his own memories. He is capable of looking back on his earlier life and analyzing the circumstances of his departure from his family with the benefit of years of experience, but when he is inside the action of the play he is completely overwhelmed, living it, victimized by it. Williams, like Proust, knew about the incredible potency of memory. In the final monologue of the play, Tom says that “a bit of familiar music” or “a piece of transparent glass” can make his long-lost sister manifest physically. Whether this is meant poetically or not, I have found it helpful, in the playing of it, to take Williams at his word. RQM: I love director Geoff Elliot’s notion that Amanda’s protection of her children is the very thing that is decaying them and preventing them from growing. Do you think Tom made the right move walking away from his mother and sister? What do you think happened to Laura afterwards? RG: The tragedy of the Wingfield family is that they love each other desperately but don’t know how to navigate their individual priorities or desires without hurting one another. I don’t know if Tom’s decision to leave his mother and sister can be couched in terms of “right” or “wrong”. I think it is a necessity. Animals gnaw off limbs to get themselves out of traps. 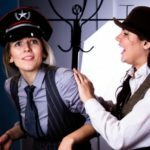 Kasey Mahaffy and Erika Soto, who play Jim the Gentleman Caller and Laura Wingfield, came up to me after a recent run-through and said it’s clear, in our production, that Tom has to get out in order to survive, but the price to pay is everlasting regret – a piece of him will always be missing. I’m not sure what might have happened to Laura after Tom leaves, but I don’t think it could have been good. Their mother has left them nearly incapable of living in the real world. When Amanda dies, where does Laura go? She has no friends, no family. It is not a pleasant thought. RQM: The piece is unapologetically autobiographical. What can you share about the real-life story which inspired the play? RG: According to a couple of biographies I’ve read on Williams, this play is very close to the bone. Apparently, his mother Edwina Williams was as verbally expansive and as cutting as Amanda is in the play. Their relationship was close, but fraught. She was in the theater on opening night of the original production. His father, unlike Tom’s, did not leave the family and headed to Mexico, but was emotionally absent and hard-drinking. A year before The Glass Menagerie premiered, Williams’ sister, Rose, underwent a lobotomy at the urging of her mother. She was in her early thirties. She spent the rest of her life in institutions, paid for by Williams and then, after his death, by his estate. 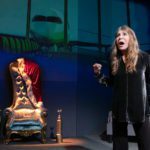 RQM: Another thing I am obsessed with in this play is how experimental it actually is on the page – slides of images, sub textual quotes meant for projection, movement in front of and behind screens and fourth wall address. Are you guys embracing those more expressionistic elements of the play in your production? RG: We are. When Glass first premiered in the mid-1940s, the technology didn’t exist that would have honored Williams’ stage directions, which are extensive. Now, as Tom, I can motion to the stage manager in the booth in the middle of a direct-address monologue and, as if by magic, a slide will appear with an image of blue roses, or a basketball star, etc. When I first encountered The Glass Menagerie, I thought it was burdened with the “Great American Play” designation, which, in my mind, meant that it was concerned with realism and subtlety. While those things are present in the actual playing of scenes, the framework that Williams sets up in the very beginning of the play keeps it from being a simple “kitchen sink drama.” The fact that Williams was dismayed at the technical limitations of the original production speaks to how far ahead of his time he was, as well as his high ambitions for the theatre-making world generally. RQM: This production marks the return of ANW legend Deborah Strang to the role of Amanda. What is one thing you learned working with her? RG: I learn something from Deborah every time I work with her. She is a tremendously generous actor – diligent, curious, always looking for new ways to work scenes. Sometimes actors who have played a role previously feel they can get away with repeating choices that they made in the past. Not so with Deborah. It’s a rare joy to be on stage with someone you know so well who is looking at you as if for the first time, every time. I strive to have that kind of in-the-moment discovery that she brings to every role she assays.